Clinical research faculty focus on such issues as drug metabolism and excretion and targeting medication through pharmacogenetics. Faculty with social and administrative research interests explore issues surrounding medication adherence and strive to develop and test interventions that will improve it. Adherence issues in older adults and people with disabilities and chronic diseases are of particular interest. Learn more about the department. Broadly speaking, medicinal chemistry involves chemical/molecular approaches applied toward drug discovery. In recognition of this and the multidisciplinary nature of medicinal chemistry, the College of Pharmacy conceptualizes medicinal chemistry as consisting of four specialized areas of research: biochemistry, biophysics, bioinformatics, and organic chemistry. Learn more about the department. Pharmaceutical sciences is an interdisciplinary science concerned with the development of drugs and drug delivery systems. 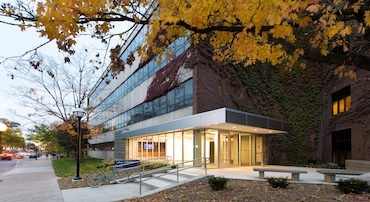 At the University of Michigan College of Pharmacy, pharmaceutical sciences research integrates concepts from fields as diverse as biology, chemistry, cell and molecular biology, chemical engineering, materials science, pharmaceutics, pharmacology, and physiology. Learn more about the department.